I remember that Egyptian kid copping plenty of flack from religious elders. Back in those days, the whole idea of using popular culture to break down stereotypes was just a little too cutting edge for middle-aged migrant male-dominated mosque committees. Since then, mosque elders have told some rather bad jokes about why swimsuit models (or at least Muslim ones) shouldn’t take off their veils. In doing so, at best they’ve unnecessarily turned their communities into a national laughing stock. Things weren’t helped by over-the-top and irrational responses to the Danish cartoons. But last night, a bunch of young Muslim Melbournians proved once and for all that mufti day is well and truly over, and that Muslims do have a sense of humour. 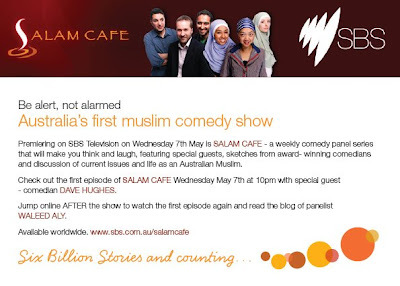 Apart from the young Egyptian (now known as Dr Ahmed Hassan, a qualified ophthalmologist), new SBS talkshow Salam Café featured a couple of young stand-up comics, three charming hostesses, an author and a guy who is, quite literally, one major son-of-a-mufti. Compeer Ahmed Imam, whose dad was appointed Australia’s Mufti last June, had the audience in near-hysterics as he helped guest and funnyman Dave Hughes dress up in the ceremonial robes and headgear of a mufti.